The Lydian Arachne, daughter of a famed dyer in purple, was herself still more famed for rare skill in weaving. Not common country folk alone, but nymphs of the woods and the streams came to watch how deftly she plied her loom, and with what wonderful art she used the needle to embroider rich patterns on her webs. So high rose her name that it reached Pallas-Athene, the goddess of such arts, to whose inspiration, men said, this humbly-born maiden must owe her skill. But to say that she needed any teacher hurt Arachne’s pride. »She is here!« rang out a queenly voice; for lo! the seeming grandam had changed to Pallas herself, who stood forth with a flashing eyes and majestic bearing. In that disguise of feeble age, she had come to spy on her earthly rival’s handiwork; and now, stung to haughty disdain, she offered to match her art against the Lydian spinster’s. Arachne had at first flushed with astonishment, but soon she recovered her confidence and boldly accepted the challenge. The contest begun forthwith: two looms were set up, at which these eager rivals plied their best craft and cunning, with such swiftness that ere long on each of the growing tissues shone in all the hues of the rainbow woven into marvelous devices, and shot with threads of gold. For her design Pallas chose the gods ranged upon the Acropolis at Athens, Jove’s awful majesty in the midst, Poseidon smiting the rock with his trident, herself in the full panoply amnog the rest, who was shown calling forth the olive tree that made her best gift to man. About this central group were depicted scenes of impious mortals brought to confusion, rebellious giants turned to mountains, and, for a hint to her presumptuous rival, prating girls changed to screeching fowl. Round all ran a border of olive foliage, as sign of whose handiwork this was, with which few would dare to vie! 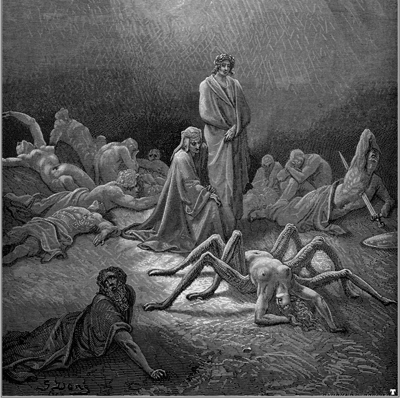 The irreverent Arachne, for her part, had picked out stories that cast shame or derision upon gods. Zeus and his brethren were shown wooing mortals in unworthy form, Apollo humbly serving as a shepherd on earth, Dionysus playing his drunken pranks, nay, scandalous memories of old Cronos himself. From such ancient tales she could choose but too many to fill out her picture, all enclosed by border of ivy leaves and flowers. But these scenes were worked in with so cunning art, that one could believe to see real animals and real waves standing out before the eye upon that accusing web, the more offensive for its truth. So Pallas-Athene felt when she rose to examine the other’s work. With a cry that was half envy and half indignation, she snatched at the too faithfully coloured cloth, tearing it to pieces, and sobering blows upon the sly maker of such a masterpiece. How might mortal maiden stand before the fairhaired goddess when her eyes blazed with wrath? Thus unfairly beaten, Arachne could not bear her spiteful shame. She stole away to hang herself in despair. Nor even then was the wrath of Pallas glutted. She bid her rival live, yet in what hateful from! For a spell was woven found her bloated body, her human features disappeared, her hair fell off, her limbs shrunk up, and thus poor Arachne hung as a spider, doomed for ever to spin as if mocking the skill that had moved Olympian envy.